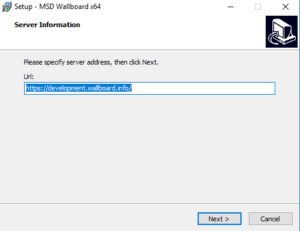 The first step of the installation is to specify the Server Address you want your client to connect to. If the allow auto update setting is selected our application will check for updates and update if needed every time the client starts up. You can allow a virtual keyboard which will pop up if the customer enters an input field. You can also give permission to always have our application appear on top of other applications. On the next page you can select the display format for your application. 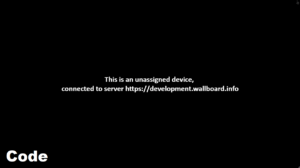 You select the Fullscreen mode to display the application on the whole screen. By default if you have more than one screen connected to your computer, it will be in extended mode. You can choose the Windowed mode to display the application in a window. You can also allow your application to be Movable, Minimizable and Resizable. 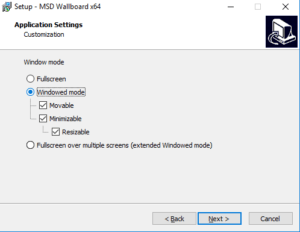 If you have selected the Windowed mode in the last step, you can now set the screen resolution. If you have selected full screen mode or extended full screen mode, you’ll be able to set the screen orientation. If you have selected the Windowed mode, you’ll now be able to select the startup position. With the Center option the application will be displayed in the center of the screen. With the Left-top option the screen will be displayed in the top left corner of the screen. If you have selected one of the full screen modes, then you can Lock your device. See more about: Locking Windows device. After the installation is complete you can register your screen in the editor interface with the four digit number displayed in the bottom-left corner of the screen.